Joel Albertus Danner (son of Joel B. Danner) was just 16 when he witnessed the battle that came to his hometown. He picked up relics from the field and crafted some of them into useful objects such as small gas lamps made from hollowed cannon balls. 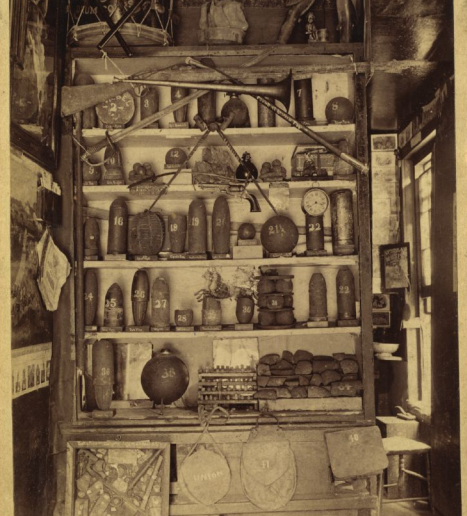 In 1865, he opened one of the first museums in Gettysburg to display his relic collection. His museum was unique in that visitors could actually purchase the displayed objects as souvenirs. Danner painted inventory numbers on his displayed items, visible in the image here, so he could easily replace items as they were sold. Today, relics from the Danner Museum are highly sought by collectors. The Danner Museum operated for several decades from storefronts on Baltimore Street. Joel A. Danner published “Danner’s Pocket Guide Book of the Battlefield of Gettysburg, and History of the Battle with Map” during the 1880s, one of many early guidebooks available to Gettysburg tourists. The house that Joel A. Danner grew up in still stands on the southeast quadrant of the square and houses the historic Inn at Lincoln Square. Photo Courtesy of Sue Boardman. Sue Boardman is a licensed battlefield guide, Cyclorama historian, and leadership program director of Gettysburg Foundation, where she has led leadership tours for corporate, nonprofit, government, and educational groups. She has authored the book, “The Battle of Gettysburg Cyclorama: A History and Guide,” as well as “Elizabeth Thorn: Wartime Caretaker of Gettysburg’s Evergreen Cemetery.” Boardman is a contributing writer to Celebrate Gettysburg magazine.